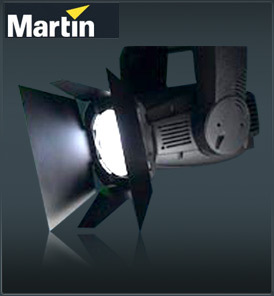 Designed especially for use in theatrical environments or situations where greater control of the beam of an automated wash light is required, Martin has developed a fully motorized and fully closing set of Martin Wash Barn Doors for the MAC 2000 Wash. The Martin Wash Barn Doors were conceived in the original design process of the fixture after consultation with lighting designers from around the world. The barndoors come fitted with a wide angle lens as standard. Quarter-turn screws allow users to easily remove the standard front lens and replace it with the barndoor module, complete with lens. No cables are needed as the module plugs directly into a socket already equipped on every MAC 2000 Wash fixture. An individual DMX channel controls each of the Martin Wash Barn Doors’ four blades. Additionally, each blade can fully close over the beam of the fixture. For further flexibility, an additional DMX channel gives rotational control over the entire module, allowing it to be rotated through 100 degrees. This gives the possibility to align both the small and large doors to any angle required. Now, with this practical and convenient accessory, designers can have full beam control over their high-powered wash fixtures at anytime.